This stele is tall, measuring approximately three feet high. But it is not just vertical height that makes this free-standing stone sculpture appear human, or anthropomorphic. While both sides are sculpted, emphasis is on the front, particularly the face, chest, and waist: a trapezoidal head rests directly on squared shoulders with the outline of a face framing two closely-spaced eyes and a flattened nose; on the robed figure’s torso a necklace hangs with two cords diagonally crossing the body with an awl (a small pointed tool) attached; and at the waist, a double-bladed dagger hangs from a wide belt that continues around to the back. The sculpture is simple, even abstract, but clearly represents a human figure. What is a stele? 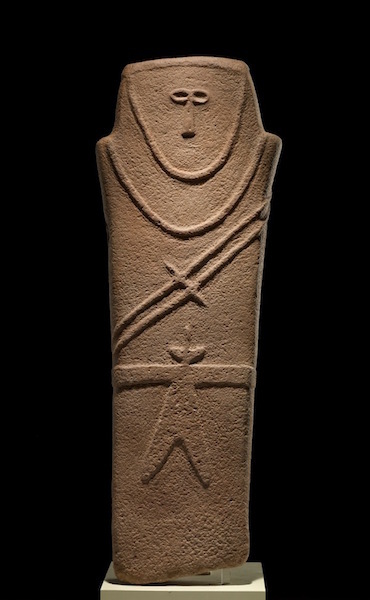 Found in a small village near Ha’il in northwest Saudi Arabia, this anthropomorphic (human-like) stele was one of three discovered in the region. The trio join a corpus of more than sixty low-relief sculptures in human form dating to the fourth millennium B.C.E. and discovered across the Arabian Peninsula in the last four decades. Despite the vast territory in which they were found (some 2,300 kilometers, stretching from Jordan in the north to Yemen in the south) these stelae (the plural of stele or in Latin, stela) share certain features and characteristics. How can this be? 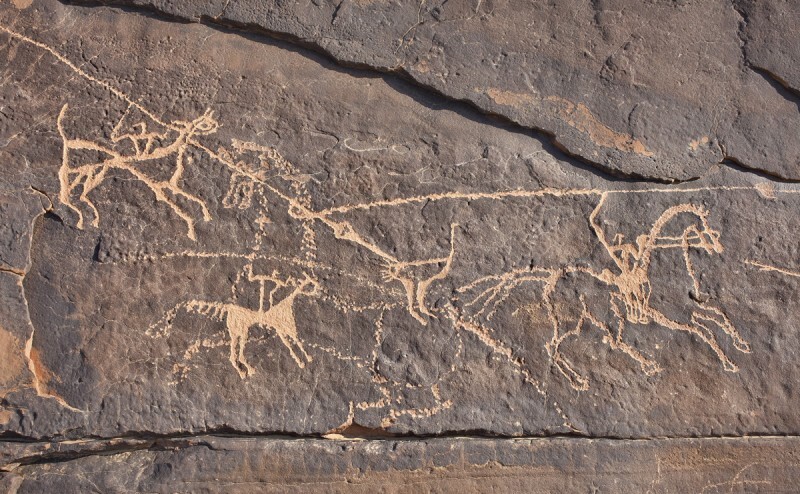 While today Saudi Arabia is known for its desert sands and oil reserves, in prehistoric times the environment and landscape were dramatically different—more fertile and lush, and readily accessible to humans: early stone petroglyphs depict people hunting ostriches (see below), a flightless bird that hasn’t been able to survive in the region for thousands of years. What is a petroglyph? It was during the Neolithic period, from the sixth to the fourth millennium B.C.E. when the Arabian Peninsula was more like a savannah than a desert, that small groups of hunter-gatherers gradually shifted their economy from predation to production by domesticating such herd animals as sheep, goats, and cattle, and settling in oases and mountainous regions linked to one another by caravan trails. Due to changing climactic conditions these settlement sites were often only temporary—occupied seasonally but repeatedly, and probably for centuries—yet it was this constant need for movement that stimulated communication between regions and interaction among its societies. But more than just people moved along Arabia’s caravan trails: ideas and objects travelled too. On a rock wall at Tabuk, close to the Jordan-Saudi Arabia border, two human silhouettes dating to the late Neolithic period show the same cord, awl, and double-bladed dagger as the Ha’il stele. In Riqseh, in southern Jordan, a broken stele has been found with a similar awl and dagger. 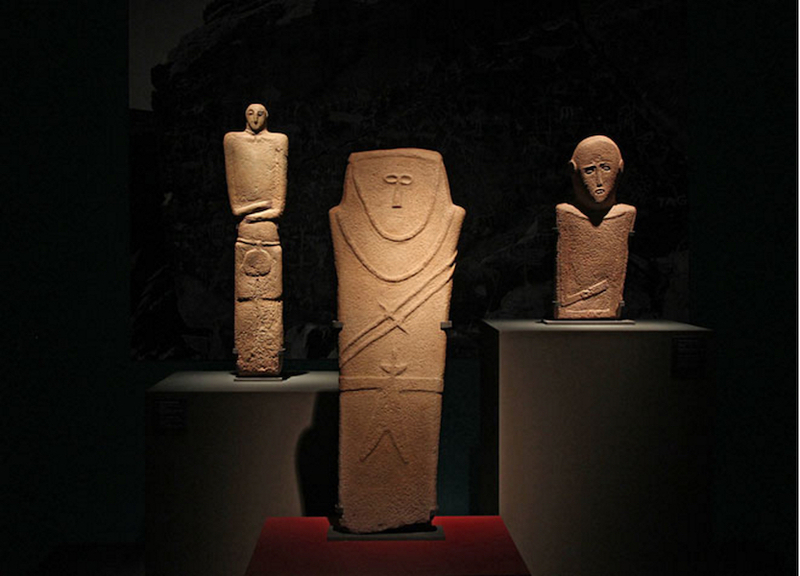 While in Southern Arabia stelae are considerably smaller than in the north (some reach only 40 centimeters high), examples from Rawk in Yemen display the same characteristic lack of detail as the Ha’il stele. This evidence of stylistic influence, coupled with the presence of exogenous materials (materials that originated elsewhere), confirm that during the Neolithic period objects were circulated and exchanged across wide swathes of territory. What is just as interesting as this common visual repertoire is the shared anthropomorphism: each stele represents an upright male figure carved in stone—remarkable, for it is figural representation in a land thought for so long to have none. Indeed, for many, the history of the Arabian Peninsula began with the rise of Islam in the seventh century C.E. when artistic expression was focused on the written word and human form was largely absent. But what the Ha’il stele reveals—what the full corpus of anthropomorphic stelae show us—is the existence of a pre-Islamic Arabia in which the human figure dominates. Archaeology is a relatively new field of study on the Arabian Peninsula: surprisingly, it is only within the last forty years or so that scientists have been able to shed light on Saudi Arabia’s early material culture to recognize a historical and cultural past largely ignored and previously believed to hold no importance at all. Before Arabia traded in incense, before Islam (when Muslims traveled in pilgrimage to Mecca), during the Neolithic period early caravan trails expanded into an intra-regional network that eventually spread externally into contact between Eastern Arabia and Mesopotamia. It was this early contact that positioned the Peninsula, in the Bronze Age and through Antiquity, as the center of an active and interconnected Ancient World—a commercial and cultural crossroads bridging East and West—linking trade and pilgrimage routes that reached from India and China, to the Mediterranean and Egypt, Yemen and East Africa to Syria, Iran and Mesopotamia. Despite apparent visual similarities it would be a serious error to assume that the meanings and symbols of each stele were everywhere the same—each region, village, and tribe is believed to differ in custom and to have developed strong local traditions. To avoid the risk of assigning generalized meanings to distinct anthropomorphic stelae excavated across the Arabian Peninsula, scholars have increasingly focused on local culture in their analysis of material history. In other words, they have looked beyond what appears to be a common style to conduct a fine-grained analysis of each stone’s unique context of local social and ritual practices. 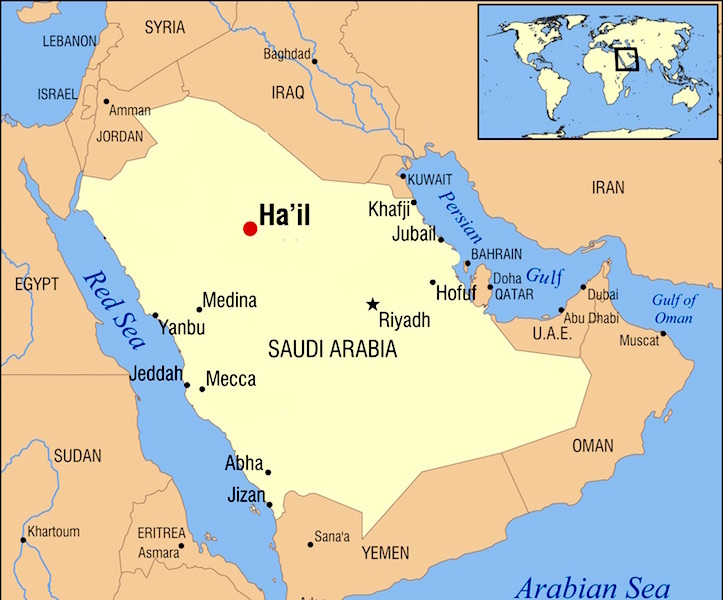 With this in mind, how are we to interpret the Ha’il stele, one of the Arabian Peninsula’s earliest known artifacts? Archaeologists believe that the Ha’il stele was probably associated with religious or burial practices, and was likely used as a grave marker in an open-air sanctuary. While we do not know who produced the stele (just imagine a specialist stone carver working among mobile pastoral herders), we continue to be intrigued by the quality of the carving and its minimalist, yet expressive, representation of the human figure. While carved or inscribed stone stelae were used primarily as grave markers, they were also used for dedication, commemoration, and demarcation. Stele is the term used most often in the Mediterranean World, yet similar objects called by other names and dating to most periods have been found throughout the world including the Ancient Near East, Ancient Egypt, Greece and Rome, China, Islamic lands, and Pre-Columbian Mesoamerica and South America. Rémy Crassard and Phlipp Drechsler, “Towards New Paradigms: Multiple Pathways for the Arabian Neolithic.” Arabian Archaeology and Epigraphy 24 (2013), pp. 3-8. Ute Franke, “Early Stelae in Stone,” Roads of Arabia: The Archaeological Treasures of Saudi Arabia, edited by Ute Franke and Joachim Gierlichs (Tubingen: Wasmuth Verlag, 2011), pp. 68-71. Tara Steimer-Herbert, “Three Funerary Stelae from the 4th Millennium BC,” in Roads of Arabia: Archaeology and History of the Kingdom of Saudi Arabia, edited by Ibrahim Al-Ghabban, Béatrice André-Salvini, Françoise Demange, Carine Juvin, and Marianne Cotty (Paris: Somogy Art Publishers: 2010), 166-169. Cite this page as: Nathalie Hager, "Anthropomorphic stele," in Smarthistory, December 31, 2015, accessed April 22, 2019, https://smarthistory.org/anthropomorphic-stele/.